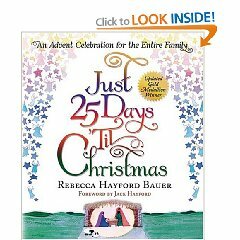 I started getting ready for this month a few weeks back, by pulling out my copy of The 25 Days of Christmas: An Advent Celebration for the Entire Family, by Rebecca Hayford Bauer (a Goodwill snag). Originally published by Victor Books, it seems to have been picked up and republished by Charisma House and retitled Just 25 Days 'Til Christmas (and is available through Amazon) . (See, so you can pick which title you want by your mood. A whole TWeNtY FiVe DAYS of ChrIStMaS!?!?! Or "Just 25 days unnnntiiilllll..." (which could freak you out if you aren't careful). Either which way, this book won a Gold Medallion Book Award and although I am not familiar with the specifics of such an award, I am sure it is deserving. This book breaks down the Christmas story into 25 days. There are 25 devotions, 25 scripture verses you can memorize, 25 songs to sing, a suggested schedule for how to organize gift buying and travel arrangements, etc., to afford you the most peace possible during the holiday season. I love it. We will also memorize the song, "Hark the Herald Angels Sing." I'm excited to expand our knowledge of what it meant for God to send His son down to earth. It is the best and most important message of Christmas (and life in general) and to share the wonder and excitement of it with little ones has to be the best thing in the whole wide world! We sure plan on having fun with it. It is a picture from right outside our house. 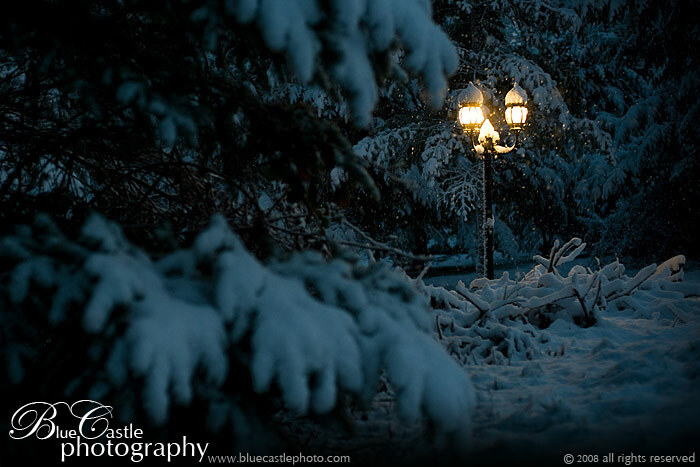 Yes, we have a Narnia lampost (on purpose). I have to repost the picture again because it's still one of my favorite images that Jonathan has ever captured. It's so Narnia! Happy thoughts, happy memories. December 1st was already booked for this year though so we decorated on Sunday. I love having the house decorated for Christmas! Pictures forthcoming. And that reminds me! It's now also Christmas Movie Watching Season, legal, no fines attached! Do you have a favorite song that you just love to listen to during the Christmas season? Leave a comment below with the name of the song, or a url to a youtube post and I'll go and give it a listen! This Little Babe from Britton's "Ceremony of Carols". The music is moving and the words are potent and meaningful. This is my favorite Christmas song ever. I love White Christmas! I started listening to my Christmas music Saturday. Our Choir has been practicing our Christmas music for a while now. To see..and hear..about it please go to my blog. Elisabeth - I listened and then I looked up the lyrics. Powerful! For in this weak unarmed wise the gates of hell he will surprise. His martial ensigns Cold and Need, and feeble Flesh his warrior's steed. And thus, as sure his foe to wound, the angels' trumps alarum sound. My soul, with Christ join thou in fight; stick to the tents that he hath pight. Within his crib is surest ward; this little Babe will be thy guard. If thou wilt foil thy foes with joy, then flit not from this heavenly Boy." Collettakay - as you know I hopped over to your place and took a listen. There are some songs worth getting stuck in your head! "If you're not a fan of Christmas..."
I couldn't run a blog that catered to people who aren't fans of the most wonderful time of the year. So many favorites! I love Carol of the Bells, but my favorite of all is O Come, O Come, Emmanuel by the Brendon Consort. Unfortunately I could not find a sound clip. They are a Gregorian Choir. I LOVE Gregorian chants!